I did a journal page last night, and I wanted to share the story behind it. 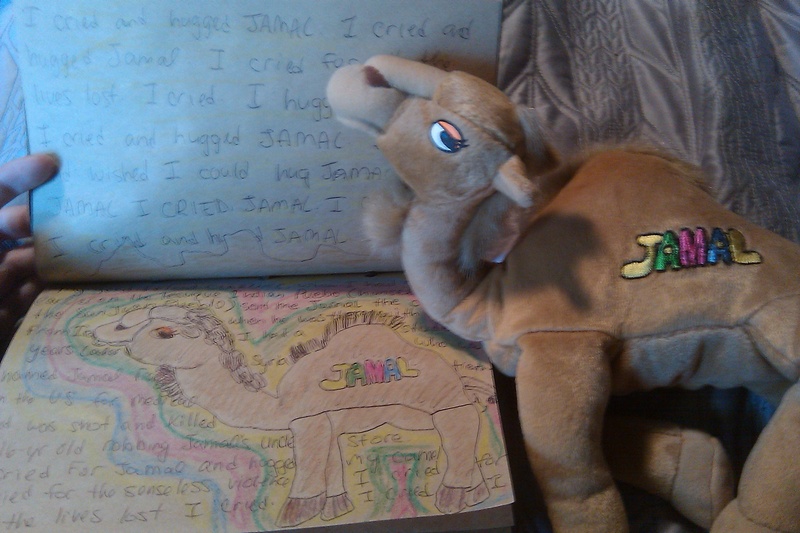 Jamal-the-camel was sent to me from my friend Clarence when he was stationed with the Army in Iraq. I first met Clarence at the Tesuque Indian Pueblo, where he was the handyman, bus driver, janitor, general do-it-all guy at the day school. I helped him build a greenhouse, along with other students from Mount Union College, and he taught me some of the Tewa language. A language spoken at the Tesuque Pueblo, and also at Clarence’s Pueblo, the San Juan Pueblo. The Tesuque Pueblo is famous for it’s “Camel Rock,” a rock shaped like a camel, and even has a Casino named after it. Anyways, Clarence and I became quite good friends and stayed in touch, even (or especially) when he was in Iraq, where he sent me Jamal-the-camel from. Fast-forward several years and I am teaching computer classes. One of my students in a soft-spoken journalism major from Syria. His name is Jamal. Jamal came to the U.S. to get a new prosthesis fitted for his leg. He is staying with his Aunt and Uncle, who own a convenience store. He is helping out there. I immediately liked Jamal, found kinship in our love of writing, was drawn to his quiet peaceful nature. I helped him make a powerpoint presentation on his favorite actress, Aishwarya Rai. The morning of August 27th, 2007 on my way to work, I heard on the radio that Jamal was dead. He had been shot and killed during a hold-up at his Uncle’s deli. I posted about the incident and my feelings then, and I withdrew to my nature journal to find comfort. I am still missing Jamal and still don’t know how to deal with the senselessness of it all. But Jamal-the-camel has provided me comfort since then, and I hug him and think of Jamal the 28 year old man who was my student and friend. Everything is connected, somehow. Even if we only see it in retrospect.